Review Policy | Oh, for the HOOK of a BOOK! I’m an author, poet, journalist, editor, writer, and marketing and public relations professional of over 20 years. I have Bachelor of Arts degrees in Journalism, English, and History. You can read more about me, my businesses, my writing, and my reading at About Erin Al-Mehairi page. I am currently willing to accept e-mails about books for review in almost any genre, and prefer fiction (literary, historical, fantasy, historical romance, suspense, thrillers, mystery, and certain types of horror). I also accept inquires about poetry. I read books for children, YA, and adult. My daughters also both review here and they accept middle readers and adult as well as still enjoy picture books. Please understand that I have a busy job in publishing and I am also an author myself, so my wait and amount of books taken will be longer and lower than some book review sites. I enjoy doing interviews, hosting guest interviews, and other as determined. I will try my best to review every book I receive in a timely manner, but please be patient with me. I *STRONGLY* PREFER PRINT COPIES if your book is available in print. If interested in having me review a book on my blog, and have marketing presence through me with social networking avenues such as Facebook (I have 2200+ personal, 1000+ Hook of a Book), Twitter (4,300+), Pinterest (800+), LinkedIn (700+), GoodReads (700+), Instagram (900+), and Google+, then please send me an e-mail about your book to hookofabook@hotmail.com. Please “like” my page on Facebook where I share even more book news (let me know if you have a link to share! ): www.facebook.com/HookofaBook. Please make sure to indicate if there is a date you’d love to have it posted by (such as a release date, launch date, blog tour, etc.) and if you want a recommendation on any other commercial site (Barnes and Nobles, Amazon…). I prefer tangible (hard or paperback) books, because this gives me the entire book experience which I think readers crave. Also I spend a lot of time working behind the computer and one more minute of reading on it is usually something I don’t need. Reading helps me relax, but not on a computer. They also look lovely in my library and I thank you to those who do this (I like to read when waiting in the car picking up the kids from school, at the park, the beach, and in bed). You usually you are rewarded with pictures taken and posted on social media and you are pushed higher on the list, but will also read for Kindle or .pdf if only version or absolutely necessary. I understand where the publishing world is moving today and that many authors only publish on e-book. I am happy to work something out. Please use the hookofabook@hotmail.com e-mail address and to receive my physical mailing address. Photo of Author Deborah Harkness and I at her book signing on July 22, 2012. I am willing to do author interviews, guest posts, and giveaways on my site. I look forward to them! As a trained journalist, this is my forte. Please send your request for me to be part of your blog book tour, Q & A session, or host for a guest post. Send your inquiry to hookofabook@hotmail.com. 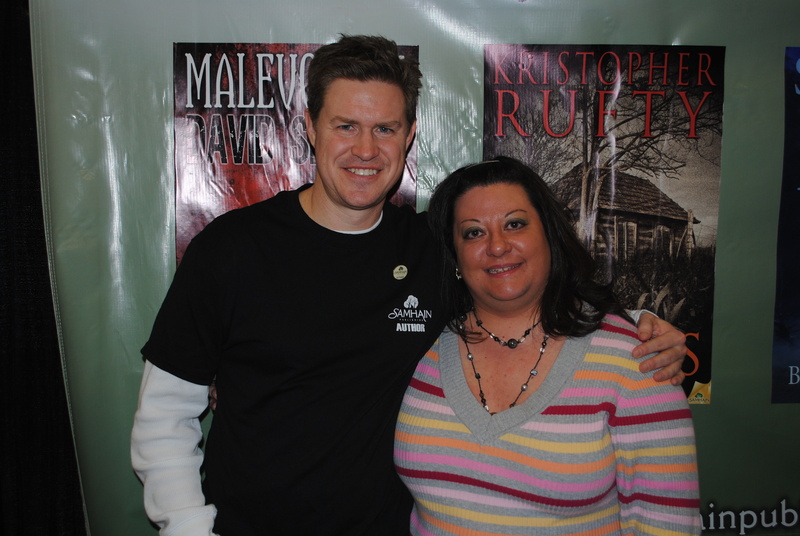 Photo of me and Brian Moreland at HorrorHound Cincinnati in March 2013!